The Arcade Contemporary Art Projects Gallery at Webster University’s Gateway Campus hosts the opening reception of the exhibit Sisu: A Female Exhibition on Saturday, March 10, at 6 p.m. The exhibit is being curated by members of our 2018 BFA Senior Class and the participating artists include current Webster Students, Alumna and Faculty. This exhibition is being held during Women's History Month and intends to sparks questions and action. Join us on Saturday, Feb. 3, from 6-9 p.m., in the Arcade Contemporary Art Projects Gallery at Webster University’s Gateway Campus, for the opening reception of the exhibit "Adorn or Disfigure," a collection of work featuring student artists in the Department of Art, Design & Art History. 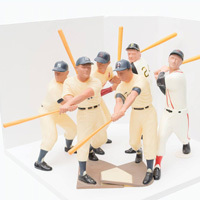 The exhibit runs through Feb. 28, and is free and open to the public. 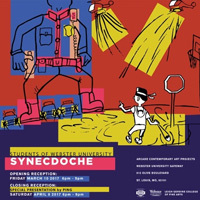 Webster University Arcade Contemporary Arts Projects will host an opening reception for the exhibition of "Synecdoche" on Friday, March 10, at 6 p.m., featuring work from many students in the Leigh Gerdine College of Fine Arts. 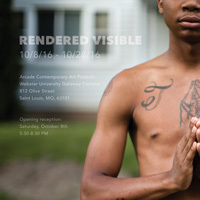 An opening reception for "Rendered Visible" will be held on Saturday, Oct. 8, from 5:30-8:30 p.m. at Arcade Contemporary Art Projects located at Webster University’s Gateway Campus in downtown St. Louis. "Rendered Visible" is a curated exhibit of works by seven artists addressing the topic of American incarceration and the justice system.